​​State Trust Lands in Colorado currently total nearly 3 million surface acres. The federal government endowed the lands to Colorado in 1876, the year the Centennial State officially joined the union. 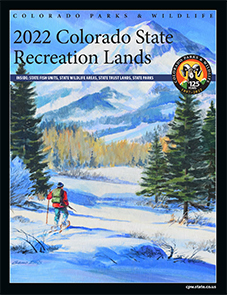 Public access for wildlife-related recreation on 500,000 acres of State Trust Land (STL) is made possible through the Public Access Program, a lease agreement between the State Land Board and Colorado Parks & Wildlife. Signs at individual properties describe allowed uses, rules and time frames for public use. State Trust Lands include about three million acres of state-owned lands used for a specific purpose — to generate revenue and provide financial support for Colorado public schools (K-12) and other public institutions. Lands enrolled in the Public Access Program are open to a variety of wildlife-related uses, including hunting, fishing and wildlife viewing. The listings on the following pages provide information regarding allowable uses, site-specific rules and timeframes for use. Most lands are not accessible by vehicle, ATVs, or snowmobiles, and there may be additional restrictions on camping, parking and off-road driving. Unauthorized use or activity on these lands may be subject to enforcement from CPW officers or local authorities. Most properties are open for wildlife-related recreation from Sept. 1 through the end of February, unless listed otherwise in this brochure. Enrolled lands are closed to public access all other times of the year. The State Land Board leases most properties for other uses as well, such as livestock grazing, farming, or mining. Please be respectful of these other authorized uses on these lands.